Uncertainty about traffic and TSA lines resulted in me getting to San Jose airport with plenty of time to spare before my flight. I put the time to good use with a visit to Crush. Crush focuses on wine from Santa Cruz and Santa Clara wineries. 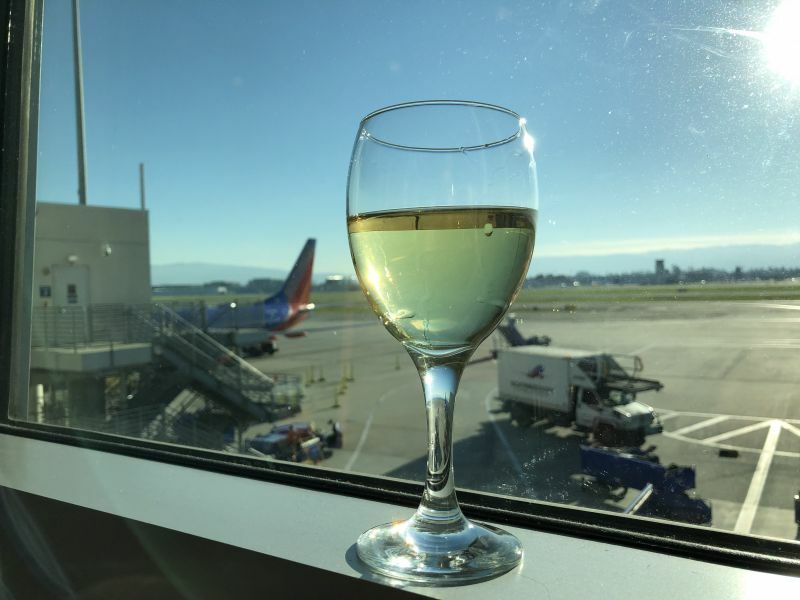 In other words, wine from areas close to the airport. I had no previous experience of these wines, so this seemed an ideal opportunity to rectify that omission. The menu listed some twenty wines available by the glass and a handful more only by the bottle. There was also a chalkboard on the bar that listed a few specials. Two sizes of pour were available: 6oz (177ml), 9oz (266ml). For a menu focused on tasting wine, these measures are on the large size. In the US, 5oz (147ml) is the standard and in U.K, 125ml is a common measure. My tasting experience did not get off to the best start. I asked my waiter if either of the Riesling or Gewürztraminer were dry. He looked blank and admitted he did not know. He redeemed himself by offering me a taste of each wine. He came back with a generous pour of the Gewürztraminer, but they were out of the Riesling. Fortunately, a sip of the wine was enough for me to determine that this was both off-dry and worth buying. 2019 seems to be the year of Gewürztraminer for me. January has yet to end and this is the fourth different example of the varietal I have tasted. Moreover, I have enjoyed all four of them. This first wine was a Thomas Fogerty Gewürztraminer. Its nose was of honeysuckle and star jasmine. It lead with an initial sweetness, but was off-dry. As I reached the mid-palate, it exposed mineral underpinnings with a hint of pineapple. In the finish I tasted crisp green apple. Given that my goal had been to taste wine from two regions with which I was not familiar, this wine did not help. The fruit for the Gewürztraminer was from Monterey County. 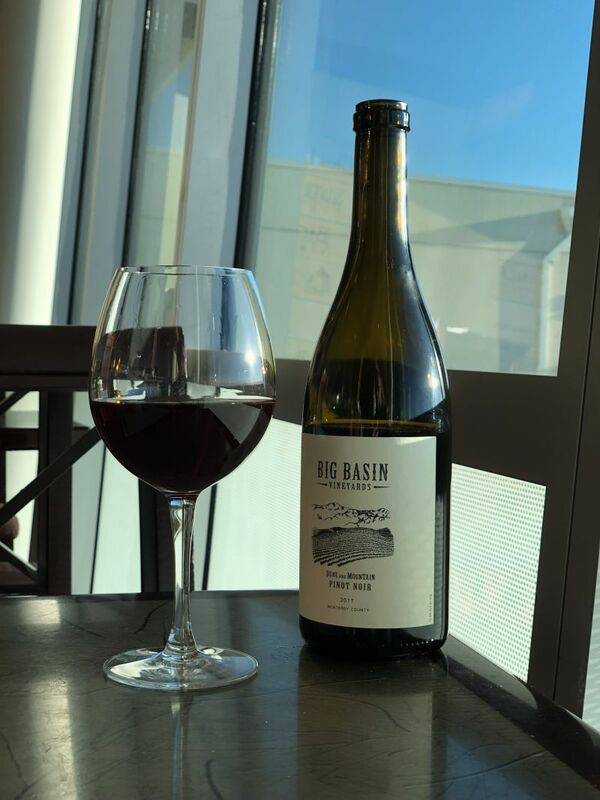 I moved to red wine and into the Santa Cruz Mountains with a Pinot Noir from Big Basin Vineyards. The low intensity nose offered aromas of dark fruit on a bed of damp earth. Its soft mouthfeel provided flavours of cherry, well integrated tannin, with restrained acidity. It offered a long finish of dust and raspberry. After several disappointing Pinot Noir wines in recent weeks this wine was a reminder of the delights to be had with this varietal. The next wine was from the Specials board. Having enjoyed the Big Basin Pinot, I thought I would try their Syrah. My positive impressions of that Pinot may be influenced by recent experiences. I have no such doubts about the Syrah; this was a delightful wine. Its nose was of brambles and rubber soaked in gasoline. Taking a sip, there was sandpaper on the front of the palate, which was followed by lush blackcurrant and plum. The finish left lingering acidity, raspberry, and a dash of cinnamon. It is a great example of the Syrah contradiction; adjectives that conjure unappealing images combine to make a delicious wine. This is not a big, in your face Syrah, but one with balance and complexity. This is wine that is ideal for sipping on a cold day by a roaring fire.